You being from Sweden, where do you buy your movies at? I know me being from Norway, i use to buy alot of movies at the border, when i take the trip over You guys have alot cheaper movies then we do. Or do you buy your movies mostly online? I buy almost exclusively online. I get most of my DVDs from Amazon UK or ImportCDs.com. When I buy from Sweden it's usually from CDON, Ginza or Discshop. I've used amazon.uk quite a bit. Good prices and ok delivery time. When i used play.com, it usually would take weeks from the shipping date to arrival. And i've used CDON alot too. But (this might be a stupid question) Do they have any stores in Sweden? I know, here they only got online stores. Yeah, we still have stores that carry DVDs. The big department stores do. And some video stores do both rental and sales. Oh, sorry that i know. Got some great one's at the Norby mall at the border what i meant was does CDON have stores in Sweden? Or only online stores there aswell? sorry about that! Oh, heh, my bad, I misunderstood your question. No, to the best of my knowledge CDON does not have any stores in Sweden. Overview Journey to the far corners of your imagination with Willow, for the first time ever on Blu-ray! Now fully digitally restored, this release features a dazzling array of extras, including new, never-before-seen exclusive content. From legendary filmmakers George Lucas and Ron Howard comes a timeless fantasy tale in which heroes comes in all sizes...and adventure is the greatest magic of all. When young Willow Ufgood (Warwick Davis) finds an abandoned baby girl, he learns she is destined to end the reign of the wicked Queen Bavmorda (Jean Marsh). 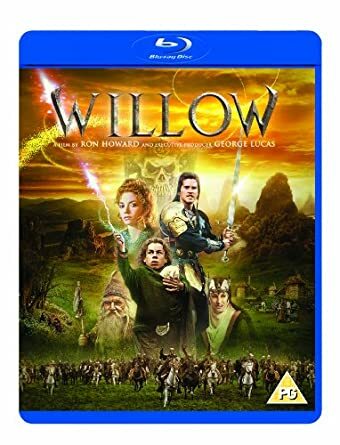 In order to protect the child, Willow must team up with a rogue swordsman (Val Kilmer) and overcome the forces of darkness in the ultimate battle of good versus evil! My thoughts One of the benefits of getting old and forgetful is that you can rewatch old movies and experience them again for the first time. Well, I may not be quite that senile yet, but it’s eleven years since I last saw Willow, and I only remembered a few bits and pieces, so it was really good to see it again. This time in high definition. So, what can I say about Willow? It’s just over two hour long. I’m kind of old fashioned, and I usually prefer my movies to confirm to the old hour-and-a-half standard. That said, Willow didn’t feel overlong. So Ron Howard must have done something right. Some of the CGI that amazed me back in the late eighties felt rather ”meh” now. Those morphs felt a bit like ”Look what we can do!”, and that’s just old school now. But I can glady overlook that. Some people have criticised Willow because the story is too much like Star Wars. Or the story is too much like Lord of the Rings. Well, boohoo. How many films have a storyline that is totally unique? Don’t overthink it, just enjoy it! It may not be the greatest fantasy film ever, but it’s good enough. So there! The blu-ray release looks stunning, and sound stunning, too. Apparently not all of the extras from the old DVD has been carried over, most notably a commentary track by Warwick Davies. Despite this I give this release of Willow a big thumbs up! One thing that occured to me while watching Willow was how much the Death Dogs looked like the shrews in Attack of the Killer Shrews (1959). I wonder if this was intentional...? Round up the family and get ready for a whole lotta fun with Disney's hilarious animated comedy HOME ON THE RANGE. 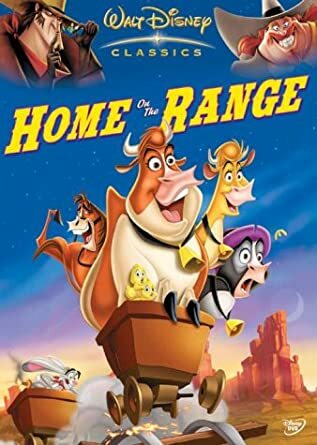 When a greedy outlaw schemes to take possession of the "Patch Of Heaven" dairy farm, three determined cows, a karate-kicking stallion named Buck and a colourful corral of critters join forces to save their home. The stakes are sky-high as this unlikely animal alliance risk their hides and match wits with a mysterious band of bad guys. Experience an all-new moo-vie adventure with stunning animation, lovable characters and original songs performed by k.d. lang, Bonnie Raitt, Tim McGraw and The Beu Sisters and written by the Academy Award®-winning* composer of Beauty And The Beast and Aladdin. *Alan Menken, Best Original Song, Best Original Score, 1991; Best Original Song, Best Original Score, 1992. My thoughts I’m a Disney animation fan. I own every traditional animation theatrically released feature on DVD except The Wild, and also most computer animated features except the Tinker Bell sequels. I have some, but far from all, of their animated direct-to-video features. That said, I held off buying Home on the Range until quite recently, mostly because of the bad reviews. Finally it was so cheap that I felt I had to give it a try. It’s certainly not Disney’s finest hour, but I don’t think it’s as bad as some reviewers have made it out to be. Perhaps it would have been better suited as a direct-to-TV release. I think the bad reviews were to a large degree because the expectations were too high. I watched it with very low expectations, and I liked it just fine. So, not one of Disney’s most memorable efforts, but not a total waste either. Approached with low expectations it is quite enjoyable. Maybe it’s time for me to buy The Wild, too? Overview The new family adventure Journey 2: The Mysterious Island begins when seventeen-year-old Sean Anderson (Josh Hutcherson) receives a coded distress signal from a mysterious island where no island should exist. Unable to stop him from tracking the signal to its source, Sean's new stepfather, Hank (Dwayne Johnson), joins the quest that will take them first to the South Pacific, and then to a place few people have ever seen. Or lived to tell about. It's a place of stunning beauty, strange and threatening life forms, volcanoes, mountains of gold and more than one astonishing secret. Together with Gabato (Luis Guzmán), the only helicopter pilot willing to risk the trip, and Gabato's beautiful, strong-willed daughter Kailani (Vanessa Hudgens), they set out to find the island, rescue its lone human inhabitant and escape before seismic shockwaves force the island underwater and bury its treasures forever, in this follow-up to the 2008 worldwide hit Journey to the Center of the Earth. My thoughts This is another of those movies that I wasn’t sure about, so I waited until I could get it relatively cheap. This is also a case of setting my expectations low. I like Jules Verne. I have read The Mysterious Island, although it was long ago. I also read the Illustrated Classic when I was a kid, and I have seen the 1961 Harryhausen film, the 2005 Hallmark TV version and the 1995 TV series. None of them follow Verne’s book very closely, and this one certainly doesn’t either. The script varies between silly and ludicrous, but at least it seldom gets boring. So, if you can put your brain in neutral for an hour and a half (at least it’s not overly long), then it can be an acceptable time killer. But hardly anything more than that. If you want a good Mysterious Island, go with Harryhausen. It’s not Verne’s Mysterious Island, but in spite of Harryhausen’s creatures it’s probably the closest you get. The TV series is also quite entertaining, but it certainly isn’t Verne. Still, either of them is better than this mess. Definitely avoid the Hallmark version, though! So, what can I say about Willow? It’s just over two hour long. I’m kind of old fashioned, and I usually prefer my movies to confirm to the old hour-and-a-half standard. That said, Willow didn’t feel overlong. So Ron Howard must have done something right. Coincidentally, just yesterday I heard someone quite Roger Ebert: "A bad movie will never be too short and a good movie can never be too long." Roger Ebert: "A bad movie will never be too short and a good movie can never be too long." Well, I would counter that by saying that a too long movie isn't a good movie. So I guess Ebert and I agree, but from different viewpoints. Well, I would counter that by saying that a too long movie isn't a good movie. I think you misunderstood me. "A good movie is never too long" and "A too long movie isn't a good movie" are the basically same thing from two different perspectives. Perhaps you were mislead by my statement that I usually prefer movies to be about an hour and a half. The key word there is usually. The Godfather isn't too long. Neither is Once Upon a Time in America or Casino or GoodFellas. I can't comment on Nocento because I haven't seen it. But if I'm watching a movie and I start thinking "Isn't this over soon?" then it's too long, and by my definition not a good movie, no matter what other merits it may have.